A riveting memoir of one woman's extraordinary effort to save her husband's life-and the discovery of a forgotten cure that has the potential to save millions more.Epidemiologist Steffanie Strathdee and her husband, psychologist Tom Patterson, were vacationing in Egypt when Tom came down with a stomach bug. What at first seemed like a case of food poisoning quickly turned critical, and by the time Tom had been transferred via emergency medevac to the world-class medical center at UC San Diego, where both he and Steffanie worked, blood work revealed why modern medicine was failing: Tom was fighting one of the most dangerous, antibiotic- resistant bacteria in the world.Frantic, Steffanie combed through research old and new and came across phage therapy: the idea that the right virus, aka the perfect predator, can kill even the most lethal bacteria. Phage treatment had fallen out of favor almost 100 years ago, after antibiotic use went mainstream. Now, with time running out, Steffanie appealed to phage researchers all over the world for help. 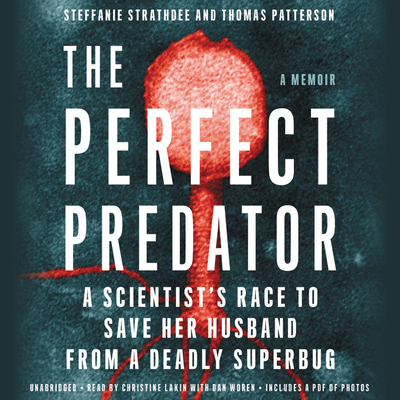 She found allies at the FDA, researchers from Texas A&M, and a clandestine Navy biomedical center-and together they resurrected a forgotten cure.A nail-biting medical mystery, The Perfect Predator is a story of love and survival against all odds, and the (re)discovery of a powerful new weapon in the global superbug crisis.